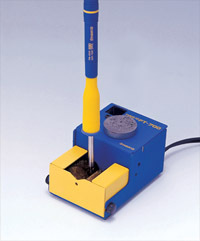 The Hakko FT-700 Tip Polisher helps increase the life of your tip with the action of two spinning polishing brushes. 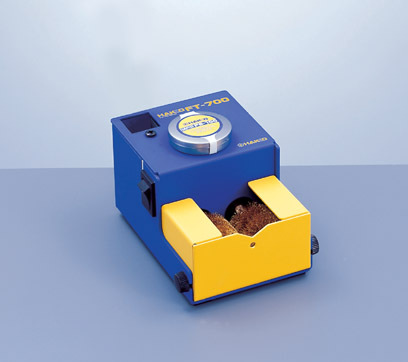 The Hakko FT-700 is an expeditious and efficient way to boost tip life and keep free from oxidation. Comes with the Hakko FS-100 Tip Polish, which has been specially formulated to boost the life of your tip and is powerfully effective when used with the Hakko FT-700. A maintenance kit to renew oxidized soldering iron tips! When hand soldering with Lead-Free alloys, higher tip temperatures and highly-active fluxes causes oxidation and corrosion, which greatly decreases the life of your soldering iron tip. 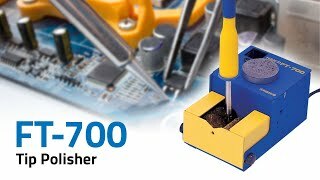 The Hakko FT-700 tip polisher helps increase the life of your tip by keeping it clean and free from oxidation easily and quickly. (2) dip the tip into the FS-100 lead-free chemical paste to re-tin the tip The fine powder Sn is melted immediately. This process will restore new life to your soldering iron tips. Incorporate the procedure above into your soldering routine and you will quickly realize the benefits of maintaining a clean, oxidation-free tip, especially when working with Lead-Free alloys. 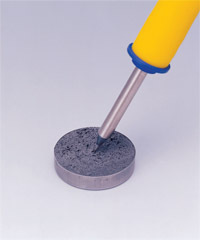 Note: The FS-100 chemical paste is included with the FT-700 tip polisher. B2798 Rubber Foot 4 pack of rubber feet for the C1492 Desoldering Control Box.